1110 N. May Street, Southern Pines, NC 28387. The VELO SMART PERFORMANCE LAB Mission is: Comfort and Performance based on science, logic, and the passion to help fellow cyclists and multisport athletes. Dr. Greg Combs is a professor of the Sport Management program at Methodist University in Fayetteville, NC, owner of May Street Bicycles and is a consultant for elite military personnel, coaches, cyclists, and triathletes. He has over 35 years of experience in training, competing, and coaching cycling and other endurance events. During his USA Cycling Elite Coaching career, Greg worked with numerous athletes and over 30 of his clients have achieved elite status. Greg has also worked with fellow coaches and former Olympians in conducting individual and team training programs, bike fitting workshops and cycling clinics. 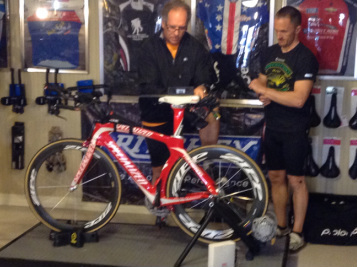 His areas of interest are in proper rider positioning, biomechanics, nutrition, and metabolic testing. He takes a holistic approach to bike fitting as a certified yoga instructor, researcher and practitioner of methods to assess and correct repetitive strain injuries, pelvic asymmetry and muscle imbalances. Greg is also a student of muscle energy technique, Postural restoration, Pendlay Olympic Weight Lifting, and Westside Barbell Conjugate Method. Velo Smart is a proud sponsor of the Velo Smart Performance Lab Race Team, Team CBC, Sandhills SandSpurs Triathlon Club. Velo Smart is also the official affiliate bike fitter for Lifetime Fitness Cycling in Cary, NC.